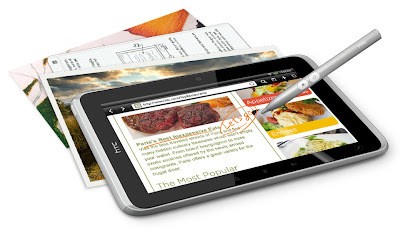 The popular Taiwan based smartphone manufacturer HTC unveiled its first tablet at Mobile world congress 2011. So what's the big deal its another device populating the already crowded tablet market? Well thats a bit difficult to say, the device seems to be fairly advance than other contenders, specially when it comes to design. It has a sleek aluminum unibody and is just 7 inches in size making it look stylish with the added advantage of portability, needless to say design has generally been a selling point for HTC. The device has a 1.5 Ghz processor which is probably the fastest in terms of clock speed for a tablet. Its got 32 GB Internal storage + expandable via microSD card, 1GB of RAM, 5 megapixel camera with auto focus and a 1.3 megapixel front camera. It runs on the older Android 2.4 (ginger bread) ditching the tablet specific 3.0 (honeycomb) this has mainly been used to keep it compatible with their HTC sense interface which adds a lot of value to the user interface. However HTC has promised about an upgrade to honeycomb in the future. The most distinguishing part about this tablet is that it has what is called scribe technology which allows you to use a pen input an integrated digital ink innovation that make it easy and natural to take notes, sign contracts, draw pictures, or even write on a web page or photo. Another new thing about this device is that unlike other manufacturers that are trying to develop games to work on the platform, HTC flyer has added support for OnLive's game-streaming service which will let you play games on the tablet. HTC says people can play a variety of games, including hits like Assassin’s Creed Brotherhood, NBA 2K11 and Lego Harry Potter. 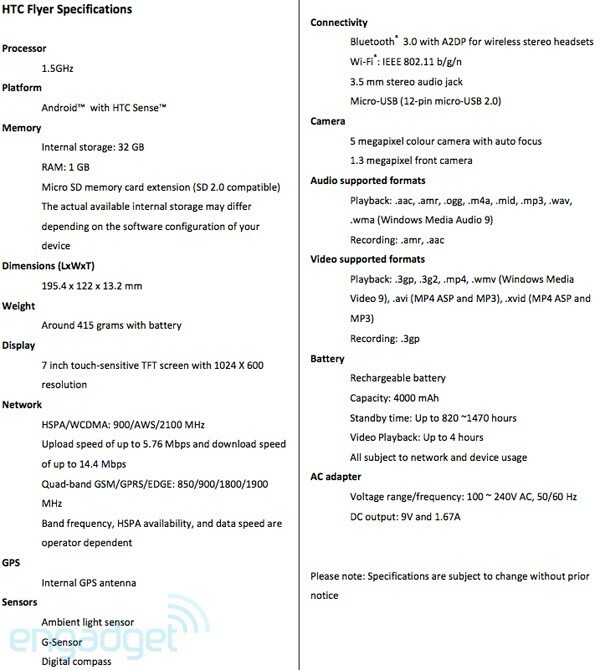 The device will be available globally during the second quarter of 2011. No details about pricing have to made available.